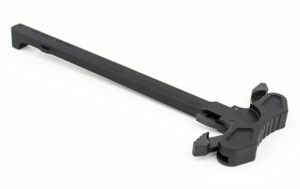 We are proud to announce the release of our new M4/M16/AR-15 (5.56 & .223)/AR-10 (.308) Ambidextrous Charging Handles!! Engineered to offer the most effective re-design of the original USGI charging handle possible. 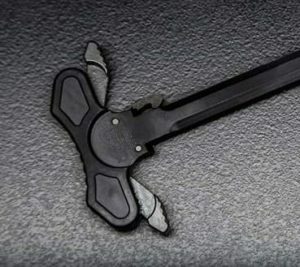 The dual functioning levers provides not only the most superior tactical operating features of any charging handle yet devised, but substantially increases the combat effectiveness of the Operator in normal or disadvantaged operational environments. Several patented added strengthening features permit them to provide superior functionality, damage resistance, survivability and operational confidence when employed with harsh handling techniques. Smooth, Light opening of the latch with no drag or hesitation. Strengthened front end nose hook surface that are over 150% strong than the standard charging handle. Re-located central latch pivot pin designed to eliminate all latch & latch pin failures. Handles are manufacture out of Mil Spec 7075-T6 Aluminum and coated with Mil-C-8625A Type III, Class 2 Hardcoat Anodize. Steel parts are Manganese Phosphate finished. Bulk pricing available, please contact Erin Tincher for inquiries.